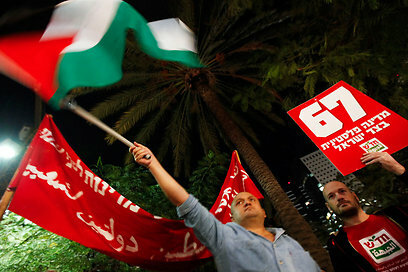 Some 300 leftist activists participated in a rally in support of the Palestinians' bid for UN recognition in Tel Aviv's Rothschild Boulevard on Thursday. 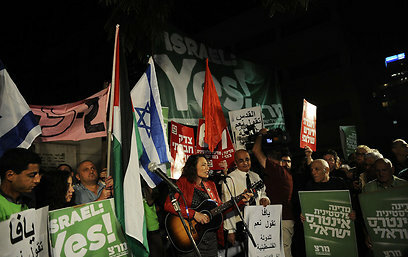 The rally was organized by several organizations including Gush Shalom, Peace Now, Hadash and Meretz representatives. The protesters chanted slogans in support of the two-state solution and carried signs reading "Palestinian state – Israeli interest" and "Israel yes." "What is happening today is an historic day for the Palestinian people and for us," said Uri Avneri from Gush Shalom. "If we choose the future we must help the Palestinians build their state." Former Foreign Ministry director Dr. Alon Liel said, "As of today there is a Palestinian state. As of today we no longer control the life of a nation but the life of a separate state." Dr. Nava Sonnenschein, director of the Wahat al-Salam school in Neve Shalom said, "We have come here to support you, Abu Mazen (Palestinian President Mahmoud Abbas) and the Palestinian people. "You have chosen a non-violent struggle and we respect that while the government talks with those who fire rockets. The Palestinians cannot wait any longer, let's work together to change reality." Arab-Israeli singer Mira Awad performed at the rally and said she was "happy with Abbas' bid and very sad about the inexplicable refusal to finally give the Palestinian people a chance to move forward." Former Knesset Member Mossi Raz said, "We call on Lieberman and Netanyahu: It's not too late. Order the ambassador to say 'Israel yes.'" 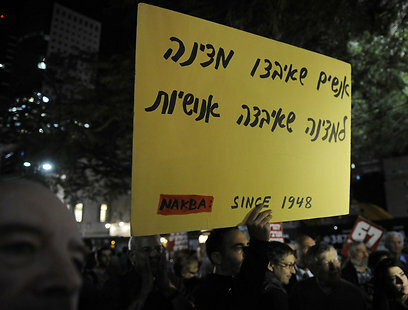 See all talkbacks "300 Israelis rally in support of Palestinian statehood "